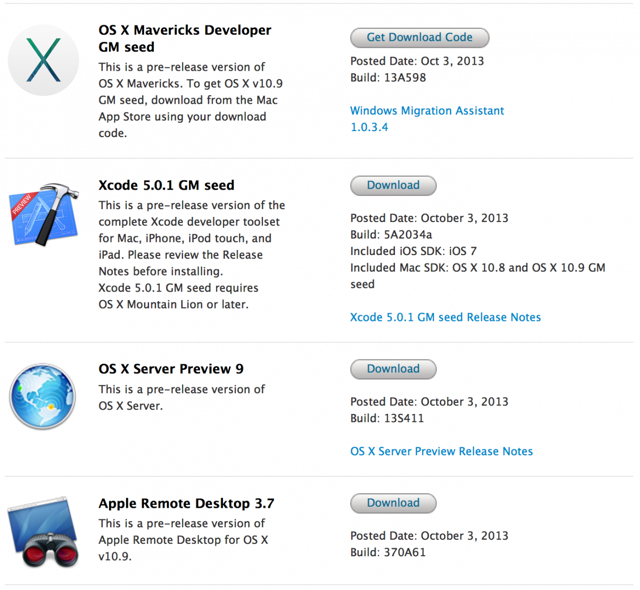 Over the weekend, Apple quietly pushed out a new build for OS X Mavericks Gold Master (GM). Previously, the Gold Master build for OS X Mavericks was 13A598, but the new build number is now 13A603. No major changes have been reported and the new build most likely fixes bugs. Reportedly, the new build cannot be installed via Software Update or via the Mac Developer center. In fact, the only way to get this newer build is to install OS X Mavericks for the first time (not update to it). It still remains unclear if Apple plans to release the 13A598 build to consumers later this month, or if it the new silent 13A603 release will make it as the final Gold Master seed. While it is uncommon for Apple to change a GM seed before release, it has happened in previous iOS releases (iOS 4 in particular). Apple will be holding an October 22 event where it will show off new iPads, OS X Mavericks, and possible more.